That doesn’t stop magic from finding her. It starts with possessed books and magical currents before moving quickly to freaky shadows and cursed spiders. Nicole turns to her best friend, Lizzie, for help, along with fellow student Austin Young, who is considered by all a magical rarity. He also happens to be the hottest guy on campus and just might be interested in her. Anyone who is a fan of Neil Gaiman and Terry Pratchett will enjoy Author Andrea Pearson’s latest series Katon University. Discern has just the right amount of creepiness (the spiders made my skin crawl for hours after) to make me think twice about turning the lights off at night without the gruesomeness of most horror books. 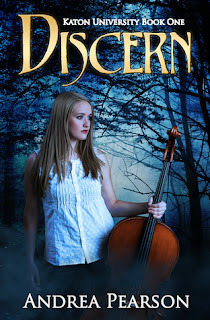 Marketed as a paranormal romance, it is a breath of fresh air in this genre. The Aretes, magical fourth children, and the unique manifestations of their elemental magic definitely piqued my interest. Although the book follows Nicole, an Arete who struggles to channel her magic, her best friend, Lizzie, and the other characters are just as compelling. I especially enjoyed Austin Young’s character and his interactions with Nicole. He has a lot to deal with himself but when his friend’s needs help he steps up. The pace of the book was great! It flowed smoothly from one scene to the next. By the end, I saw how everything worked together even though many elements were introduced. The ending was satisfying for a first book but also left plenty of questions to be answered in subsequent books. It will be great to learn more about this unique magical system and the things still haunting Nicole’s every step. Discern is currently free on Amazon.